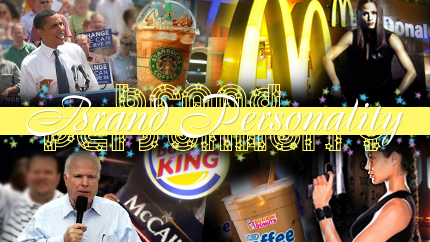 Have you ever thought about your personal brand? What I'm asking is, how do you present yourself? How is your personality projected? How would someone describe you? Are you more like John McCain or Barack Obama? Their brand personalities were extended into their presidential campaigns all the way down to their signage and choices of typeface. Or, how about Angelina Jolie or Jennifer Garner? Both have played action characters in television and the movies but are different people in real life. Maybe you are not quite as high profile or as flashy as those folks. I know I’m not. Have you ever thought about the brand personality of the client or project you are working on? Believe it or not, companies and products can have personality too. Consider what you know about the coffee that Starbucks serves as opposed to Dunkin' Donuts. Both make great coffee, but they are known quite differently for their roasted beans. You might prefer the different flavors that DD offers with your glazed donut but would you spend several hours of your day seated at their tables with your laptop? While Dunkin Donuts is known for their sinful delights in addition to their coffee, they don’t offer much back story in terms of where they get their beans. Starbucks, on the other hand, is all about the café experience, the origin of their beans and the process from which they produce a line of hot beverages. Just saying their names can evoke completely different responses. That is at least one example of a difference in brand personality. Think about how Coca-Cola is different from Pepsi and how Burger King is different from McDonald's. When working with clients, try having them align themselves with brand personalities that 1) are well-known, 2) offer something different to the world than they do in terms of products and services and 3) take them outside of the world wide web when possible to disconnect the medium from the message – at least temporarily. Doing so allows the client to open up when they would have ordinarily been tight lipped and can serve as a nice icebreaker to getting to know them. It's likely that you’ll never know clients as well as they know themselves, and it takes some prodding to get them to open up and help us understand who they are. Product personifications can come in different ways. In 1997, Apple famously aligned a line of products through their “Think Different” campaign by calling to mind such notables as Mahatma Ghandi, Jim Henson, and MLK. More recently, they personified the Mac as a hip, practical dude (actor Justin Long) opposite of the PC, depicted by a suit-wearing square plagued with idiosyncratic issues (actor John Hodgman). Apple has known the value of brand personality for years. Another recent favorite is the Backstory campaign by Veer -- a stock photography, illustration, and type company. 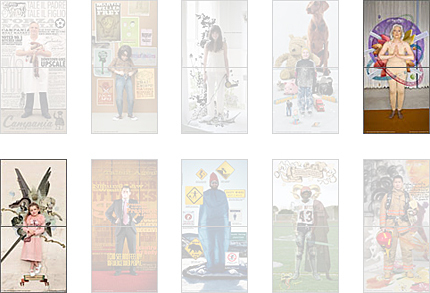 In the campaign they took a set of people from different walks of life and used the imagery that they sell to create extensions of each individual personality. For instance, a young girl who must have a vivid imagination is shown with dark scary images of dragons and rottweilers on her right shoulder and lighter images like a unicorn on her left shoulder. Similarly, an older woman is shown in a yoga pose with a zodiac and fortune cookies emanating from her torso. These are great examples of using personality embellishments to help foster creative design. In Veer's Backstory campaign, personal brand comes to life. In another example, Joie de Vivre Hotels, a chain founded and led by entreprenuer Chip Conley, finds their inspiration through magazines. Each hotel is "based on a magazine in five words." For instance, Conley states in an interview with Adaptive Path's Peter Merholz that the Phoenix Hotel -- also known as San Francisco's "rock n' roll hotel" -- is largely based on Rolling Stone magazine. Described as "funky, irreverent, adventurous, cool, and young-at-heart," the hotel is more than just a place to sleep; it has personality. Joie de Vivre's goal is to stimulate each of the five senses in accordance with the five words chosen for each hotel. They've even gone as far as building a personality matchmaker to help match guests to the most fitting hotels. 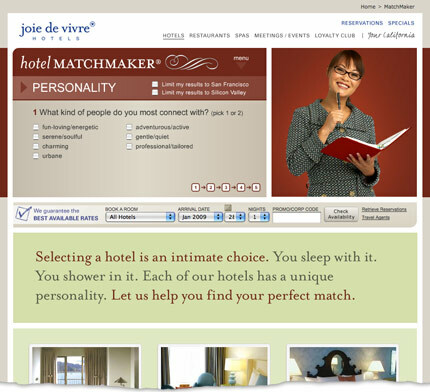 Joie de Vivre's Hotel Matchmaker will find a hotel to connect with your adventurous side. Think beyond personifications by looking into things that people use everyday. If you were a car, would you be known for your high performance like a Porsche 911 or are you more like an economical Toyota Yaris? If you were a pair of sandals, would you be Reef beach combers or patent leather wedges by Jimmy Choo? If you were a sandwich shop, would you be Subway or Quiznos? Comparisons can be made in a variety of different ways. Think hotel chains, clothing stores, cities, beverages, game consoles, and so on. Wherever there is choice, there will be differences of personality. Understanding who you are will help others understand your brand positioning. As a designer, the key is to understand how your product will speak to consumers and how you can help make it do so. Such discussions with your client can open new doors of conversation and be great cues to stylistic thinking as the design process comes together. Don’t just jump right into your favorite image editing software. Take the time to discuss the possibilities and give the client, the product, and your design the attention they deserve.